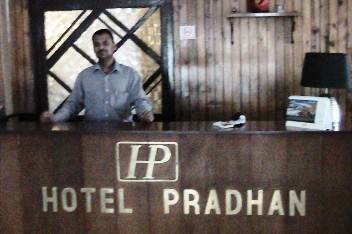 Hotel Pradhan is a budget hotel located on Gandhi Road and about 15 minutes walk from the Chowrasta Mall. 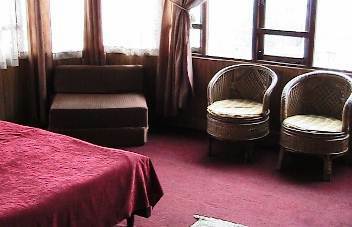 The three storied hotel was built in 1970s and is owned by a local Nepali family - the Pradhans. The first impression from outside is the hotel is lacking in maintenance. As you walk in from the road, the reception counter is right in front. Here you will meet up with Mr. Maiti, the person who has been manning the reception for some 11 years. He is living in Darjeeling for over 20 years and worked in other hotels as well. There are 17 rooms in the hotel as told to me by Maiti although the hotel's own website mentions there are 25 rooms. There is an wooden stairway that leads to the rooms in the upper floors. When I was there, there was some renovation work going on inside the hotel which I thought was long over due. There are three categories of rooms - Standard, Deluxe and Large Deluxe/Attic rooms. The large Deluxe or the Attic rooms are in the top floor and are paneled with pine wood. 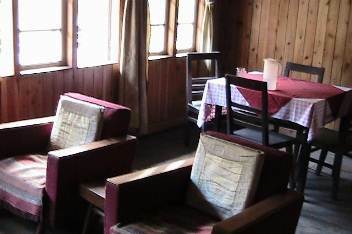 They have windows opening out to the great views of the mountain range and Darjeeling town. These large rooms have cushioned cane chairs and small sofas where you can relax and enjoy the views. 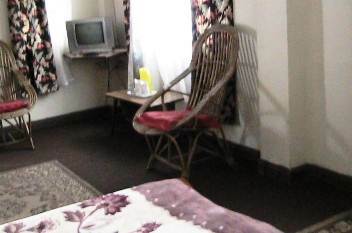 All the rooms are carpeted (some wall to wall, and some partially), have TVs and intercom phones. The beds are mostly of queen size. 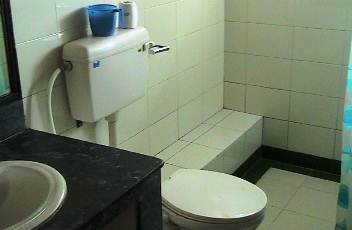 The attached bathrooms are of western style. The ones with the large deluxe rooms have counter style wash basins. Limited hot water is available in the bathrooms through geysers. There is a lobby in the upper floors with seating arrangements. From the top floor lobby, you can get views of the snow peaks of Kanchenjunga on a clear day. There is a dining room in the hotel. You will need to order the food in advance. They provide Indian, Chinese and Nepali food (usually bring them from outside). When I was there in the hotel, they were creating a huge dining space in the second floor overlooking the mountain views and having large windows on one side. The dining room was then tucked in the ground floor next to the staircase as a make shift arrangement. There is an in-house generator. It supports backup lights in the rooms in the evening if there is a power cut. The hotel is conveniently located on Gandhi Road where it's little away from the noise of the bustling town center while the Mall is at some 15 minutes leisure walking distance. The Nehru Road where most of the top restaurants and stores are located, is within 10 minutes walking distance. The gradient of the road up to Nehru road is mild and therefore easily walkable. The hotel glaringly shows signs of being worn out and lacking maintenance. From outside the hotel looks quite unimpressive. Inside, the stairway was dirty at places and the rooms were also not too clean. The carpets in the rooms haven't been replaced for a long time. They were torn at places and faded. The service is of low quality. While the people aren't bad, they lack the basic training that is essential in a hospitality industry. I have seen much more friendly and warm service in other budget hotels of its category. Although subsequently I figured out that Maiti (the person at the reception) is actually a nice person and quite cooperative, I wish he learned to smile a bit more. The hot water is provided in the bathrooms only for a limited time in the morning. The hot water flow through the tap is really slow. The hotel accepts group booking and offers dining space with kitchen to tour operators. This is an indication that the hotel is more used by tour operators who make their own food and other arrangements, while using it as a low end lodging. The hotel mentions wi-fi internet access on request. There is none in the rooms. Hotel Pradhan is located on Gandhi road and some 15 minutes walk from the Chowrasta Mall. As you walk along Gandhi road from the taxi stand, this three storied white building with green borders will be on the right. 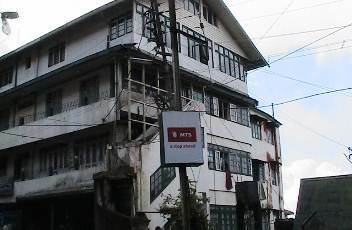 57, Gandhi Road, Darjeeling 734101, India.